Large private front yard to play with plenty of space to relax. Large and bright family room surrounded by sliding glass doors. 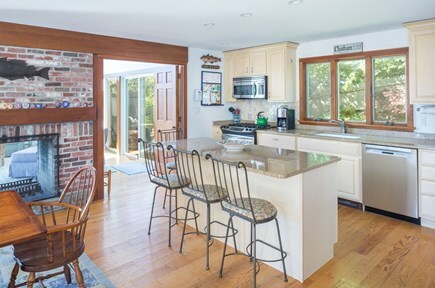 Beautiful and spacious kitchen with island seating. Seating at the dinning table for 8 guests. Large master suite. Lots of light! Guest room on 1st floor with sliding door to front deck. Ground floor king guest with sliding door out to front lawn. Play room area with flat screen TV and pool table. 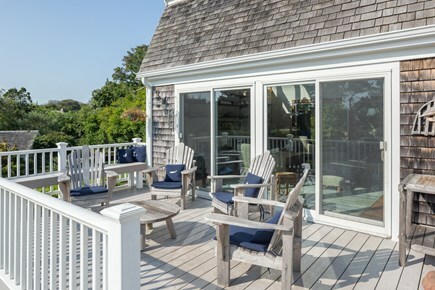 Sun filled front deck with plenty of room to relax. Patio area outback for grilling, and for an outdoor shower. So close to the water. Playground for the kids. Perfect location! 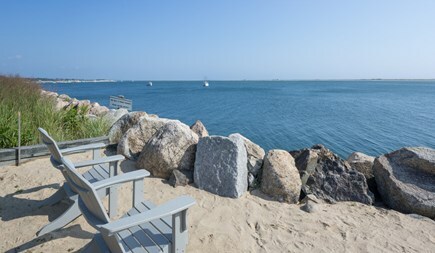 Private deeded area, which is perfect for relaxing on the water. 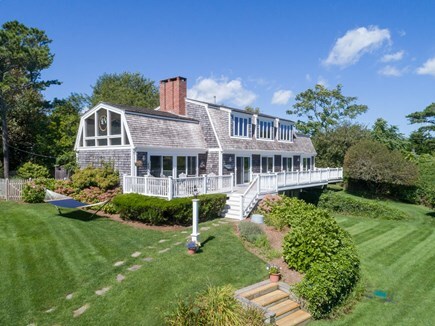 This lovely Cape Cod home is located just 1/2 mile from Chatham’s beautiful downtown shopping area. It is on the ocean side of Shore Road and an easy walk to Holoway Beach/Lighthouse Beach (2/10 mile), Claflin Landing Beach (4/10 mile), and Andrew Hardings Beach (3/10 mile). 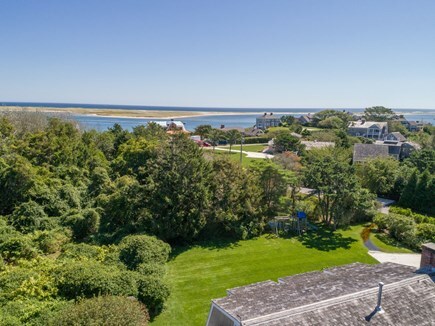 Deeded water access is at the end of the street, one house away, where you can bring a beach chair for the sand and enjoy panoramic ocean views. The house was recently renovated with a new kitchen, which includes new stainless steel appliances, a new coffee maker/grinder, toaster oven, and granite counter tops. 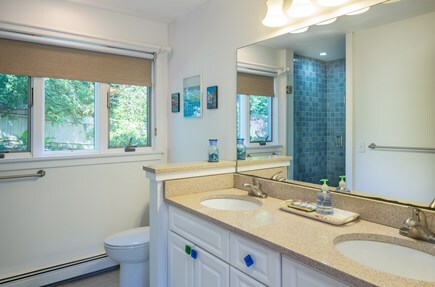 All four full bathrooms were also completely renovated. There are hardwood floors throughout the 1st & 2nd levels, with new flooring on the ground level. The 2nd floor has two large rooms on either side of the stairs, which can be divided to create four separate rooms with a 'top of the line' sound-proof sliding wall recently installed. This floor has six single beds. On the 1st floor, you’ll find the kitchen, a dining area with large dining table, and an open concept living area with a 2-story ceiling and two walls consisting completely of sliding glass doors. Also on the first floor is the 2-story ceiling master bedroom with king bed and master bath and a guest room with a queen bed and a full bath. The ground level of the house has two rooms and a full bath with laundry machines. One room at this level is a guest room with a new king bed, a couch, and a private sliding door leading out to the front lawn. The other room is an entertainment room with a foldout futon, couch, pool table, cable TV, and lots of games and puzzles. 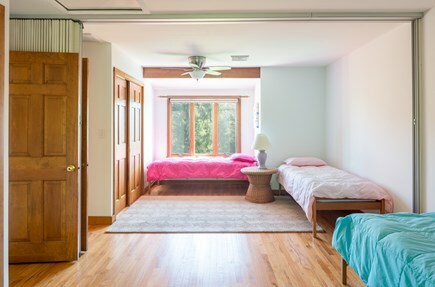 This room also has a sliding door leading out to the lawn. View our other (5-bedroom) Chatham home, ID #31050. Additional pricing info: Cleaning and linen fee is $325, State and local taxes of 12.45% will apply. Bill is the easiest to work with. We rented this house 2 times now. I's always in impeccable shape. We enjoyed our stay so much that we can't wait till the next time. Amazing! A group and friends and I stayed at this house for a weekend and it was absolutely amazing and gorgeous! 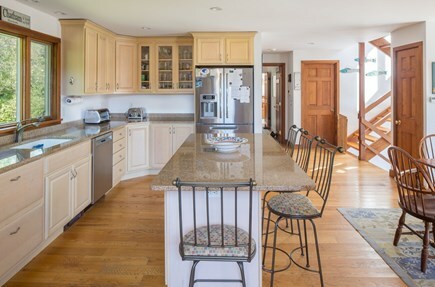 The house has a great open concept layout and a huge kitchen stocked with everything you need for the weekend. 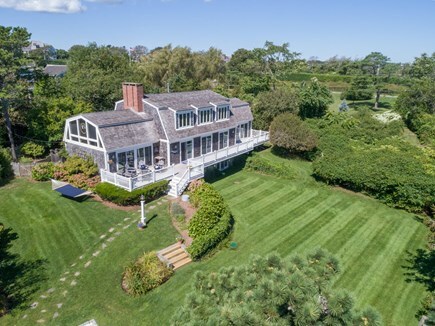 The yard, wrap around porch and beach access at the end of the road are perfect. 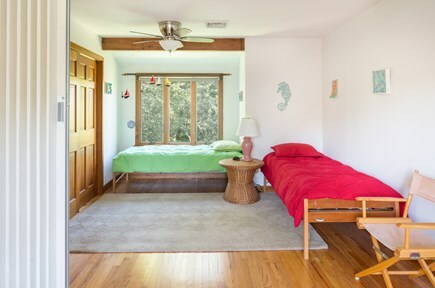 The house is in a central location, walking distance to the beach and the center! There are great restaurants and bars around. The owner was great to work with and we will definitely be back! 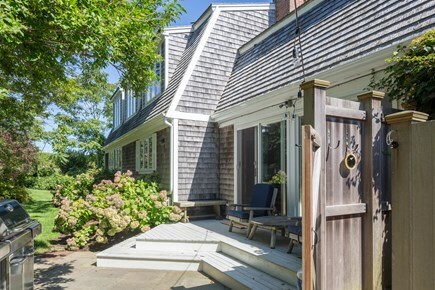 Well located within a short walk to downtown Chatham. Clean and well maintained house on a beautiful street. This is our second stay at this property and it didn't disappoint. We had our family vacation here with four families. 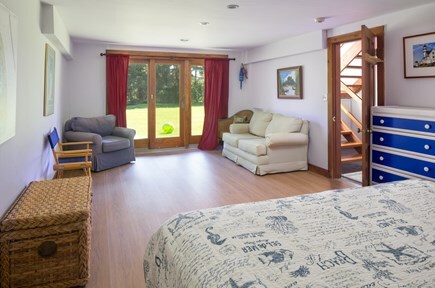 The accommodations were great for all of us: very comfortable and close to town and the beach. We will return next year!!! We recently stayed in this gem of a rental in Chatham, and we would absolutely return. As my wife said, the house is clearly full of love and fun, and those intangibles add to the home being beautiful, cool, beachy, and convenient. Everything is kept perfectly and looks new, from utilities to bathrooms, to linens, etc. 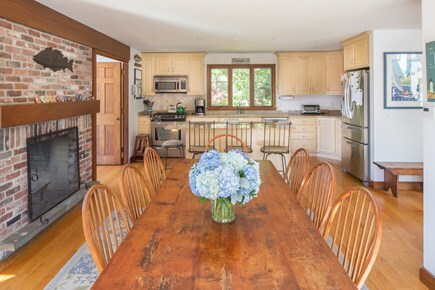 Also,there is a lot to do in Chatham, and parking isn't always easy; this home is a walk or short bike ride to anything you would want to visit. Owners are delightful and accommodating with a long history in and knowledge of the Cape. 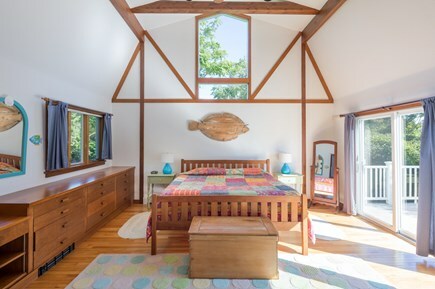 A wonderful vacation home for children and grown-ups alike. One couldn't ask for more. Enjoy your stay!